Using cloth diapers on your child can be a heck of a lot of work. So is learning elimination communication, but by using infant potty training while they’re young, babies can go diaper-free much earlier than you think. Babies will go through as many clean diapers each day as you have (it seems like it, anyway), so the washing machine gets a good workout, and there’s always a load to be hung on the line to dry. But using disposable diapers costs quite a bit, and the waste involved is tremendous. To our way of thinking, getting kids out of diapers as soon as possible is the best answer, and the fastest way to do that is to begin potty training them at a very early age – as in when they’re still infants. Elimination Communication, or infant potty training, is something so intuitive and natural in our house that it’s hard to remember that many parents don’t know about it. It’s the method that most cultures use that don’t have access to disposables or washing machines. It takes an investment of time in the beginning to start the process of elimination communication, but for those of us who are practicing attachment parenting, our children are almost always with us anyway, so it’s not a stretch for us to also begin using this method to make toilet training much more natural and easy than waiting until the child is “old enough”. An infant goes to the bathroom on a pretty regular schedule (about every 15 minutes is the norm for ours), and there are times when they don’t go to the bathroom, such as when sleeping or when actively nursing. When a baby first wakes up, there’s a window of time when they’ll need to pee, so that’s a great time to start with them. Another is when they pull off of the boobie while nursing. When that happens, you can pretty much count on a pee from them. We use a quart sized yogurt container to hold under the baby, and hold their legs up in a squat – the potty position – while making a noise that they will associate with going to the bathroom. Our noise was “psss psss psss”, which we made every time we held them over the container. That’s our verbal half of the elimination communication, but the infant also learns to communicate to us when they gotta go. We started elimination communication with our second daughter when she was an infant, and she was pretty much done with diapers by age 1 and a half. When she was old enough to want to go by herself, I built her a potty chair out of scrap wood, which I scrounged from a cabinet shop. There is a removable container (a large yogurt tub) underneath, and it fits nicely in the truck and tent for traveling. When we went on a 5 week camping trip a couple of years ago, not having to wash diapers in a bucket every day was such a blessing. As she got older, she would go into the bathroom and say “me need space”, and sit down and do her business “all by myself”. It’s so completely awesome to be free of diaper duty, and kids who can control their bladder and bowels can learn to go in the great outdoors pretty easily. I know from experience that having kids who can and will use the bathroom outside (as opposed to only while sitting on a toilet) are much easier to take hiking, camping, and on road trips. Having to find a modern bathroom with a flush toilet and a door before your kid can go to the toilet is a major drag. I personally prefer peeing outside. I don’t think I could put it into words, and it seems silly to even say it, but it’s true. Because we used a composting toilet for 5 1/2 years, I feel like I have a greater appreciation for bodily waste, and it doesn’t gross me out. There are some who will tell you that people shouldn’t just go the bathroom any old place, but those same people will also let their dog poop just about anywhere and spray urine all over the neighborhood. I don’t see the big deal about humans voiding their bladders outside (and I’m not saying you should just leave a log lying on the lawn, so don’t even go there). Very sensible thoughts. We used infant potty training with our third boy and enjoyed it very much, were delighted to start and finish sooner than we had with traditional delayed toilet learning. And now I’m using it with my first grandchild. You are the second person I’ve known of to do this with their kids. It seems rather Pavlovian, and that’s not a bad thing. It’s just a matter of training your kid. It certainly would save money on diapers (we spent a small fortune), but I’d be scared to try it for fear of getting it wrong and having messes all over the place. But, like you say, cultures that do practice it have interwoven it into their lives so it would just be an adjustment for us, nothing more. Educational, thanks. 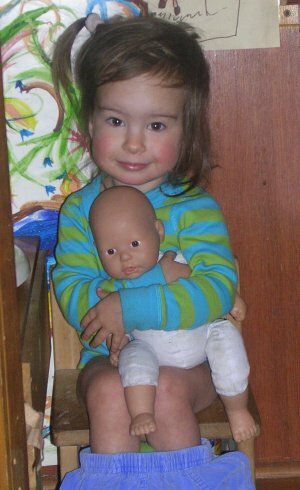 .-= Keith Wilcox´s last blog ..Reading Progress: 5 year old Alan =-. So where were you, with this great advice, when it took 2 and a half years to potty train my little one? Thanks so much I will twitter this too! Cool concept. I was unaware of this method of training when my kids were infants. So, for those whose children are already walking, the thing that worked best for me was to just let them be naked… they feel the urge, see the result, make the connection & voila… no more diapers. There were a few clean-ups on aisle 3, but I always did it in the summer when we spent a lot of time outdoors & it worked like a charm for each of my 4!! Charndra from Part Time Diaper Free! I’m a big fan of potty training before 2. I find when children hit the age of 2 and higher they are much more likely to face serious regression and can make things much, much more difficult. good advice however Learning to do the right thing by means of motivation and reward is the most effective way to potty train boys. When children associate a certain behaviour with a reward they tend to want to repeat the act more often. A good way to practice the reward system is by giving your child a reward like a favorite toy or a treat when he actually uses the potty. If your child resists or has an accident, it is best to give positive reinforcement to them rather than getting angry. Positive reinforcement is a great way to motivate children. We’ve never needed any rewards to potty train our son, who has been out of diapers since before he was two years old. We’re also very careful to never set our kids up with expectations of specific rewards for behavior, as that can backfire on you. Love the article! I’d love to get your thoughts on our IPT blog and shop! ever since I first heard of it I have been very exited to try it. It just seams natural to us. My little one is not born yet and I have discussed this with the father and we both think that we will have nothing to loose if we try it. I have the thought of having my child get used to sitting in their own waste, I would hate doing it my self and see no reason why my baby should. I’m glad to see it worked well for you. Are there any specific books or techniques you would suggest we try? I love how you broke this down! Really simple laydown with some great tips. While I sign with my kids, I hadn’t considered signing with infants to help encourage the toilet connection. What a great idea! It’s actually quite amazing that more people don’t know about EC. In countries like Japan, clothes are made with slits so kids can squat and go as needed. It’s the norm! Which really makes sense because there’s NOTHING sanitary in having your own piss and feces against your body. It’s gross! And letting kids do this until they’re two or three seems so backwards. We want to get them using a toilet, not used to wetting and crapping themselves. But we just don’t think about it this way because it’s the norm. I read about EC with my first, but it seemed like it would be SUCH an investment. I never thought of bothering with it until my Russian friend came along. She practiced this with all her children, and raved about it all while I remained a skeptic. We ended up giving birth on the same day, and weeks later when we were at a park outing I watched her take off her 5wk old daughter’s diaper and hold her baby between her legs as she hunched down over the grass. Before I even had the chance to open my mouth to say something, that baby was squirting poop onto the grass below. I couldn’t believe it! So I finally decided to give EC a try with my own 5 wk old. I kept it simple by bringing him to the toilet whenever I checked his diaper (about every two hours). I’d hold him over the toilet and make a “Psssss” sound. I also got the idea of blowing air between his legs to help bring attention to peeing. In no time, he was peeing into the toilet. Soon he was pooping too. I didn’t get stuck on “catching” every pee or poo. It was my first time, and I wanted to keep things simple so that I would actually do it. I kinda fell off the bandwagon around 6mo when he started squirming being held over the toilet. Then I had to have surgery and I dropped it all together. He’s over a year now, and I’m finally getting back into things. I bring his attention to my own toilet usage, and I’m teaching him the words and signs for poop and pee. Now and then I let him go without a diaper on the hardwood floors, and whenever he pees I make sure to bring his attention to it. Connections are definitely being made, now I just need to make time to put more effort into it (new job and moving has me putting this off, but I’m almost there).